Luvart is the name of a Brazilian act, but to be honest, I had not heard of them before. They sort of started playing ‘for real’ at the very end of last decade. But apparently they had been around for a short while during the first half of the nineties too, yet without a successful career, maybe with exception in their local scene. Anyway, after some demonstrational recordings and a split with fellow-countrymen Coldblood, they recorded and released a first ‘real’ album in 2012, called Necromantical Invocation, via Hammer Of Damnation. 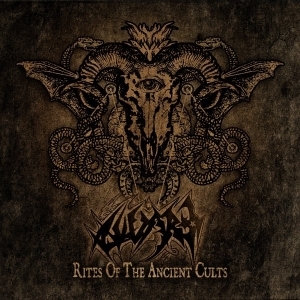 A couple of years afterwards, in 2015, they returned, with a slightly adapted line-up, resulting in the recording and release of Rites Of The Ancient Cults. That material was recorded (+ mixed and mastered) at the Metropolis Studio with recording assistance of Rodrigo Itaboray, who did some session guitar play on the album too. Eventually, the result got released via France’s Drakkar Productions – actually their Brazilian sub-label Drakkar Brazil - with distributing assistance of Sulphur Records from their home country. Now it is my honour to write down my thoughts on that material. Rites Of The Ancient Cults lasts for forty-five minutes and it sounds as if it were written (not recorded – see the next phrase) in the early years, two or three decades ago. First about that sound. Twenty-five years ago, it would have sounded less ‘full’, but we’ve entered a new century a while ago, haven’t we. It does not mean that the sound is clinically produced or so, for it is not. Actually, the production is somewhat unpolished and, maybe, even too unclean. Yet then again, it’s the fine mix that puts its mark, focusing on the importance of all individual elements coming together in an organic symbiosis. It might seem funny to read this, but I would have preferred a little, tiny little bit more elegance when it comes to the engineering, the recording quality. But then again, I do not mind this roughness, for it is so much better than a clinically polished production, evidently. Once again, I am totally impressed by the drum attacks by Flavio (aka Blood Devastator; member of the band since its resurrection eight years ago), though also the other members’ achievements are enormously cool. As a matter of fact, all ingredients are melted into a very tasty dish. Once in a while, Luvart come up with some keyboard lines, and without exception those ones are so great. Really, I think that the subtle and limited yet pronounced use of those synths are of a quality beyond average, even though they are quite limited in use. Whatever; this old styled stuff has so much to offer. Band leader Brucolaques (during the band’s nineties’ existence, he was known as Evil’s Guardian, by the way) came up with such great ideas, paying tribute to the roots of the Death / Black scene in general, canalising his Luciferian ideas by creating massive compositions that just pay honour to the roots of this scene. And you know: it is a successful result called Rites Of The Ancient Cults that defines this dedication!